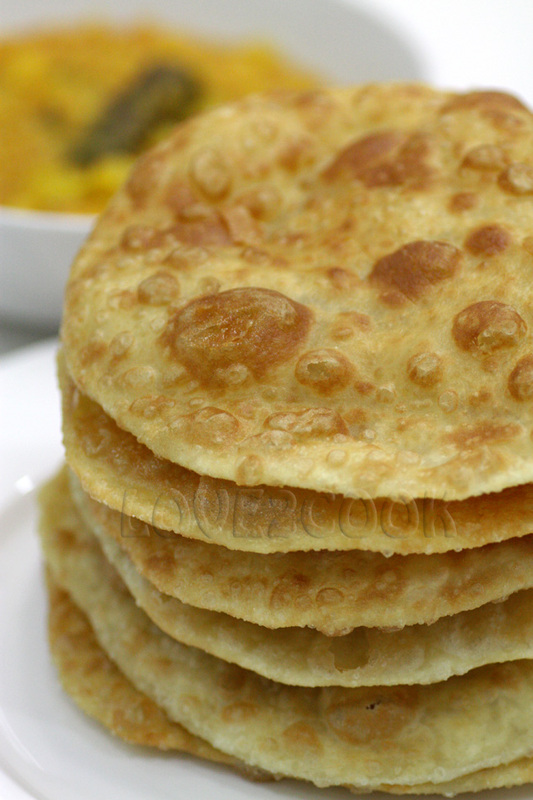 Today I shall be sharing Poori (Fried Indian Flatbread) by my Mom. 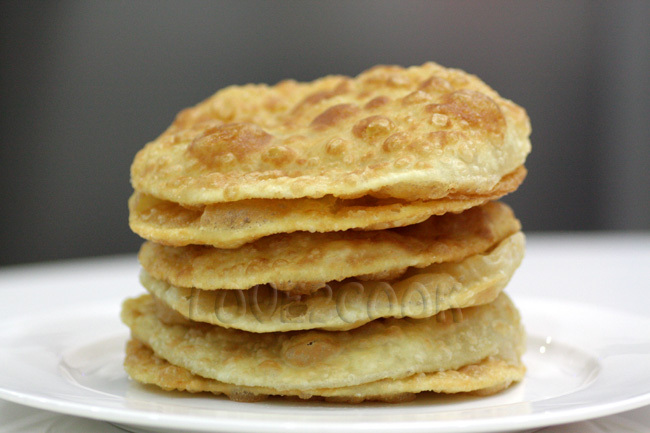 I love poori but never tried making them on my own. Liked the ones my Mom does only. So I requested her to make some for me during her visit last weekend. Mom said there are few more ingredients can be used to make pooris. This is the simplest way she does. Told her to come over again to do the other recipes...hehe! Come on, check out the Poori..super duper crispy version!!! In a large bowl, mix flour with salt, sugar and margerine until it resembles breadcrumbs. Make a well and slowly add the boiled water. Use a wooden spoon to mix and form a dough. Cover with a damp cloth and leave the dough to set for 30 minutes. Make smaller balls from the dough by hand. Spread some flour on the rolling board. Roll each ball into circles with 4mm thickness. Heat oil in wok. Deep fry the flattened dough. Press gently with a slotted spoon to puff up the poori. Fry till golden brown and turn over. Once cooked, drain on paper towels. Continue with the other rolled balls. Done...enjoy with some Potato curry...yummylicious!!! 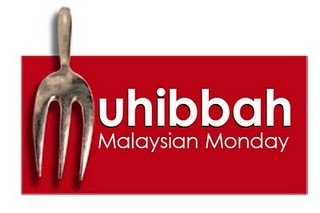 Sending this entry to Shaz's Muhibbah Malaysian Monday! You got flu?Kesiannya...hope u'll get better soon ya? The poori looks so yummy..eh do u have a recipe on how to make idli?During my college years i (every deepavali)my friend served it and since then i fell in love with it..haha She always served idli with this thick mutton curry..alamak..drooling la! wow you made them so thin!! must be uber crispy! Morning Love..nampak sungguh sedap roti puri tu. look's like it so crispy! Kak tie boleh rasa keenakannya! Omg, puri with potato masala both together tempts me a lot..
forget to put aside one piece for me....hehehe. everyone's fav. poori bhaji...love it pics are so tempting ! i love poori... with sambal sardin.. hope u're feeling much better.. I have to start making some Indian food too. I see so many beautiful recipes like this one that I just want to enter in the kitchen and start making things. sedapnya puri....mkn ngan dalca sedapp kan..
Looks fabulous! I have always wanted to make poori! Thanks for sharing this. Your mom is super! He he he, I like puri more than roti chanai....always eat with potato masala! yum yum! These pooris look so delicious I wish I can have a few now. I also like that potato curry you serve the pooris with...yummy! Hi Love. Looks yummy... I never eaten poori before.... must be nice eh. they look absolutely delish..crispy-crunchy n the pic with aloo curry is too tempting!! hi dear! sori lambat wish epi thaipusam! sebenonyer kan akak takut tgk patung tuh! hihihihi........ anak nak roti tuh love! nampak menarik ar akak nak bookmark lah! Geram nengok. macam crispy chips jer. Mesti sedap tuh! 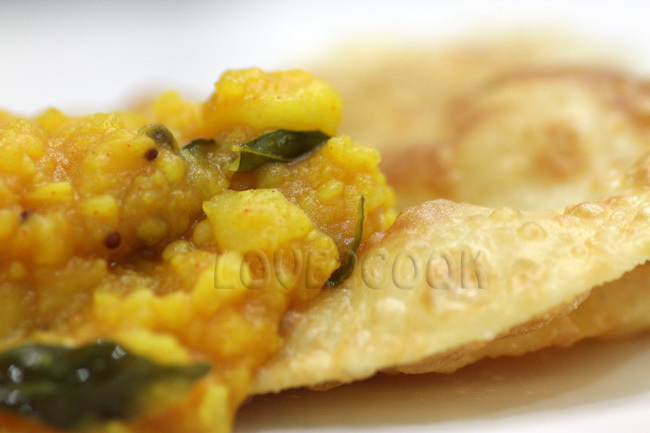 Pooris look crisp and delicious! I'll go for the super-duper-crispy version any day! i've been looking for the potato curry recipe. is it possible for you to share the recipe with me? i love it so much! especially when served with poori.